I found this awesome post on one of my favorite blogs! (Homemade By Jill) I think this was one of the first blogs that I would look up daily; years before deciding that I would try out blogging! She actually found the tutorials for this dress here and here. This dress was super easy and turned out to be the cutest little dress-up dress ever! 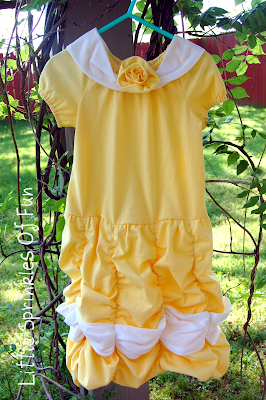 I used these two yellow T-shirts to create this cute little "Belle" dress! My daughter loves it! She just turned 3. When I got it finished she said, "That's cute momma!" So sweet! I made it a little big so that way she could play in it for at least a year or two! 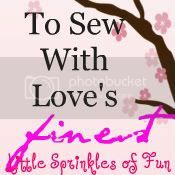 Btw, I'm following from Swingin' By Sunday and hope you'll come join my Spring Blog Hop, too. This is cute enough she will be playing in it for more than a couple years! Thanks for sharing! I just found your blog and am your newest follower! This dress is fabulous and has left me completely inspired!! Thanks for creating such a fun place to visit. That is so adorable! I gotta go look up the tutes now. Hi! I am your newest follower. Your blog is so cute! I look forward to reading more of your posts. Please come check out my blog and follow me back. I would appreciate it. Awww.... It really is cute. 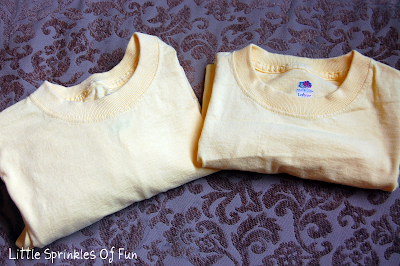 I absolutely love yellow too! Great for the Summer as well. Please come visit us at voiceBoks - The Voice of Motherhood and find out what everyone's saying, doing, etc. There, you'll also meet a really great group of wonderful women who love to connect and meet new people. Too cute! I so wish I still had someone small enough to wear this. So cute. Thanks for sharing. My daughter would love this. I will for sure have to check out the tutorials!! WOW! How pretty! I bet that looks adorable on! wow that's awesome! I love it. I saw you on polka dots on parade! That is awesome, I love it!!! Alicia, love the yellow dress! Linking this up with us made the Creative Bloggers' Party & Hop better and more special. Thank you! THis is super super cute! I'd love if you'd link up to Sew Woodsy! Darling! I'm sure she'll love to wear it. I saw this a few days ago and knew I needed to save this idea. LOVE IT! I wish I would have seen it before we went to Disneyland. I am featuring it at somedaycrafts.blogspot.com. Grab my "feature" button. Cute and I love the color. Just wondering how that ruffles are made, eh.